Sri Lanka's largest party announced Saturday a legal challenge to President Maithripala Sirisena's sacking of parliament, a move that has plunged the Indian Ocean island nation into fresh turmoil and alarmed the global community. Sri Lanka has been in a political crisis since October 26, when Sirisena fired his prime minister, Ranil Wickremesinghe, and replaced him with former strongman Mahinda Rajapaksa. The United National Party (UNP) of the deposed Prime Minister, Ranil Wickremesinghe, and its coalition partners will mount a legal challenge, according to their members. His request for a floor test to prove his majority in the House has been turned down. Wickremesinghe has insisted his firing is unconstitutional and demanded that Parliament be summoned to prove his majority. Sirisena also accused Wickremesinghe and another Cabinet member of plotting to assassinate him, a charge Wickremesinghe repeatedly denied. Sirisena's United People's Freedom Alliance (UPFA) admitted ahead of the president's stunning announcement that they had failed to secure enough cross-over MPs to win a confidence vote in the House. Urging the Indian government to condemn the "murder of democracy", the Dravida Munnetra Kazhagam (DMK) leader said the Union government must take steps to ensure a dignified life for Tamils with peace and security. Even as President Sirisena's decision is being legally disputed, newly sworn-in Prime Minister Mahinda Rajapaksa and his supporters have welcomed early polls that will establish "the will of the people". 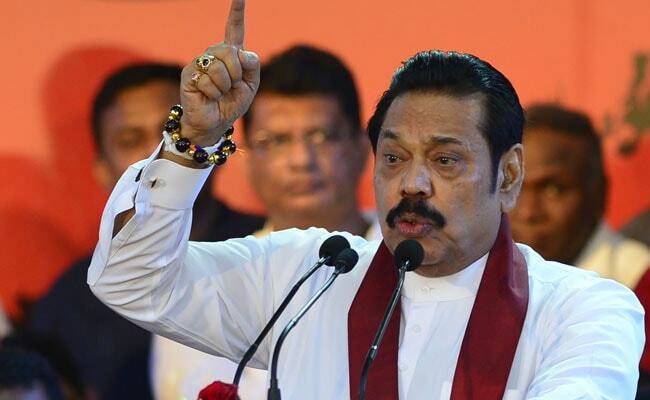 Former Sri Lankan president and the man who was sworn in as Prime Minister Mahinda Rajapaksa supported the dissolution, and said, "As leaders, it is our responsibility and obligation to give the people the opportunity to voice their opinions on the future of #SriLanka". But the admission of a lack of a majority had fuelled speculation that Sirisena may sack the legislature and go for a snap election. This is despite several legislators saying they were offered millions of dollars to switch allegiance. Under pressure from the local as well as global organizations including the United Nations, European Union and Western governments, the President chose to reconvene the parliament on November 14, just two days ahead of the scheduled date. The worsening political crisis in the Indian Ocean island nation has alarmed the worldwide community. The EU, in a joint statement with Norway and Switzerland, called for parliament to reconvene and hold an immediate vote. The speaker of Sri Lanka's parliament, Karu Jayasuriya, last week warned that the country could descend into political violence if the legislature remained suspended.